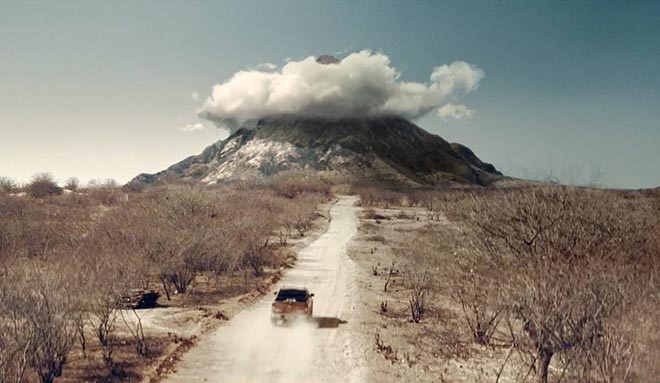 Nissan Brasil is promoting the new Nissan Frontier four wheel drive pickup with The CloudCatcher (O Caçador de Nuvens), a commercial in which two young farmers take drastic action to save their village from drought. The men are despairing over their dried-up crops when one of them has a bright idea: although their village is parched, there’s a stubborn rain cloud around a nearby mountain that refuses to move. They devise an ingenious scheme involving their Nissan Frontier truck, some ropes and a makeshift parachute that will eventually bring a piece of cloud down to the village. The commercial was filmed in Picotes, a village in Paraíba, northeastern Brazil, where it hadn’t rained for six years. Just as a the final rain scene was about to be shot, it actually started raining. The CloudCatcher campaign, with the tagline “#ÉMaisQueForça” (More than Force) is also made up of magazine and newspaper ads, a microsite, social media pieces and CRM. The Nissan Frontier CloudCatcher campaign was developed at LewLara/TBWA by chief creative officer Felipe Luchi, creative directors Sthefan Ko and Gustavo Diehl, creatives Sthefan Ko, Fabio Santoro, Pedro Paes, Guilherme Possobon and Renato Simon, RTV team Luzia Oliveira and Cristiane Marinari, planners Renata d’Avila, Luciana Mussato, Maria Fernanda Haddad, Murilo Chagas and Luiz Menezes, media team Luiz Ritton, Thiago Ferraz, Suellen Kiss, Daniele Farhat, Bruna Dantas and Renato Pierote, general account director Wilson Negrini, account team Xiko Coutinho, Raiza Scatena and Caio Bottan, working with Nissan Brasil marketing team Arnaud Charpentier, Humberto Campusano, Mariana Lemos, Fabio Lima, Juliano Fortini and Murilo Almeida. Filming was shot by director Rodrigo Saavedra via Landia, Sao Paulo, with executive producers Carol Dantas and Sebastian Hall, director of photography Javier Juliá, and production designer Julian Romera. Visual effects were produced at Clan VFX. Colour grading was by Marla Colour Grading. Sound and music were produced at Supersonica, by sound designer Vinicius Villani, account director Cristiane Marquesi, composers Antonio Pinto and Gabriel Ferreira, and voiceover artist Denis Garcia.